Quite a lot of horrors are coming out at the moment, one such film is The Forest that is set in the infamous Aokigahara forest in Japan where over the years many many people have gone to kill themselves. The trailer hadn't blown me away and I had a feeling the film itself wouldn't either. Natalie Dormer (Game of Thrones) stars as Sara Price; an American who has travelled to Japan to try and find her missing twin sister Jess (also Dormer) who went missing while visiting the area around Aokigahara. Despite the certainty of everyone she talks to that her sister is dead Sara is convinced by her 'twin sense' that she is actually just lost in the giant forest. She teams up with a local guide and Aiden (Taylor Kinney); an Australian reporter and heads into the cursed woods where her real troubles begin. The Forest is a frustrating experience in that it does so much that is right, yet so much that is wrong. Of Dormer herself I thought she did a fine enough job, her character had her fair share of demons and this actually plays into the plot well. Aokigahara is said to prey on unhappy people and due to many flashbacks to her childhood, as well as frequent nightmares it is evident Sara is not a well balanced woman, she is warned many times about the dangers of the place but with her wanting to find her sister a decent enough incentive is created for the viewer to care. There are a few scenes that call for both sisters to be on screen together, they have the worst use of editing to mimic the same actress playing two roles at once by cutting to whichever one happens to be talking. A decent sense of paranoia is created with Sara and Aiden, it is suggested that he is not all that meets the eye and so inadvertently ending up lost in the woods with what is essentially a perfect stranger makes for some creepy moments, and double edged scenes were the actions of a character can be taken to be either nefarious or benign depending on the point of view. This balance over whether the real danger is corporal in nature or supernatural (or even a bit of both) is not that well handled with an over reliance on shoving some of the least effective jump scares ever committed to film down your throat. These jump scares inevitably involve a demonic face bursting into extreme close up focus but are so telegraphed that not only me, but no one I could see in my line of sight in the cinema so much as slightly shuddered. On that note; shame on you The Forest! Shame on you for ending on one of these pathetic CGI ghost scares, especially shame as what would have been an effective chilling last line of dialogue to the film is demolished by one last failed attempt to cheat fear out of the viewer. Some of the special effects do look pretty decent, at one point Sara is hallucinating that she has maggots burrowing under her skin, while the various corpses encountered (the suicide forest lives up to its name) all look grimy and washed up, and there is a great moment in a cave involving a creepy Japanese school girl. Going back to these jump scares though, they don't look great, especially one during a dream sequence where a monstrous face is super imposed onto a little girls. There are quite a lot of these dream sequences and at first are there as a means to make horror before plot wise the prime location is reached. As Sara sees the same demonic faces in her dreams that she does when she actually gets to Aokigahara makes some of the impact of the place diminish slightly. I hated the dream parts, and that a major plot point happens in one of them I didn't appreciate as made them essential for the film to make cohesive sense. There was one really great flashback sequence actually; Sara explaining a tragic event from her past to Aiden that is far different to the twisted actuality being shown on screen. The location of the forest at least looks great, the woods look suitably different to the usual American forests, their foliage looks almost humanoid in nature at times, especially the scenes shot in day break just felt quite oppressive. There are some nearly cool Book of Shadows: Blair Witch 2 moments where it seems the woods themselves are messing with the characters mind such as one sequence where a river looks like it is running one way then, when it is shown again the water is moving in the opposite direction. The narrow trees also make for some effectively creepy moments during a few chase sequences where it looks like figures are standing by the trees a character is running past. 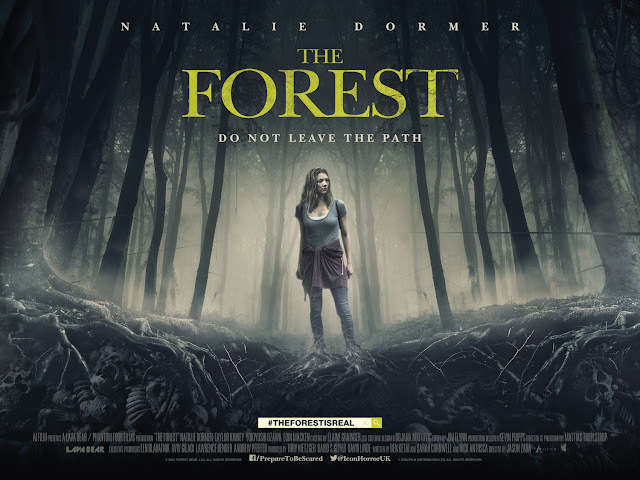 The initial explanation about the forest seemed a bit heavy handed, I don't know if I am in the minority but I have certainly heard about it loads before so having multiple characters explaining why it is so evil seemed not needed. For all it's effective paranoia making and questioning over what is really happening it is a shame that it is the forceful inclusion of needless jump scares that really bashes The Forest down to average level, whenever momentum is created these pop up to destroy the tension, what could have been a solid psychological supernatural terror instead feels like a bit of a wasted opportunity, especially as it was a bit different having a heroine with a damaged psyche.